There’s an awe inspiring double bill at the Sydney Entertainment Centre and we’ve got tickets! We’ve also got great seats and low energy levels, so I really hope I can stay awake! We are in for a massive musical treat, and to start with, a trip down Memory Lane. First up, there’s INXS, who this year are celebrating the 25th anniversary of their landmark album, Kick. I can’t believe it’s been that long! How time flies when you’re having fun! The doorman is a bit bemused as to why we want to see a band “without the singer,” but then he obviously hasn’t seen or heard their new frontman Ciaran Gribbin, who is charisma personified. This band is a classic example of an oldie, but goodie, and they still have the inXs factor as they romp their way through all their greatest hits. It’s mind blowingly good! Once upon a time we would have beered and buoyed ourselves up inbetween acts, but these days we’re much older, and much more tired, so we by pass the bar and the booze and try and recharge with a coffee instead! And that’s what we do; there’s music, there’s moments and there’s magic. Rob’s right. Tonight, we really do celebrate life. The band romp their way through all four of their fantastic albums and we get carried along on the musical time travelling ride. We’re not surprised when the band bounce back onto the stage for the encore. But we are surprised that they bring INXS with them. I can hardly believe what I’m seeing… Matchbox Twenty and INXS performing together, and, on the same stage. What a fantastic finale. 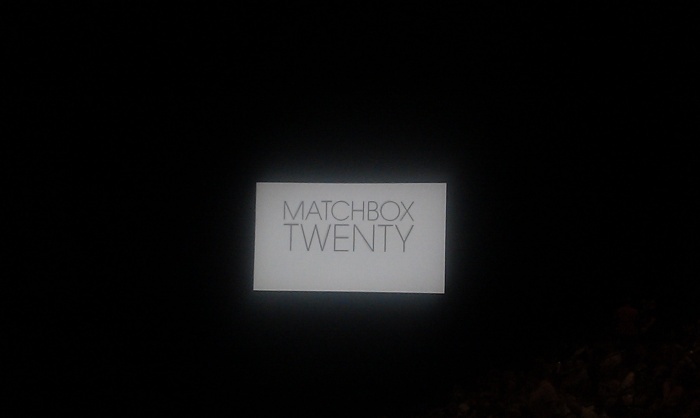 I can’t wait for Matchbox Twenty to come back to town. I only hope they don’t leave it so long next time!